In past times, China’s presence in the world did not have the current environmental impact. Nowadays, China extracts 4,000 million tons of coal per year, three tons per person. This represents a great local and international environmental burden. And yet, we still have much to learn and discuss about the social and environmental implications of Chinese “development” within and beyond its borders. 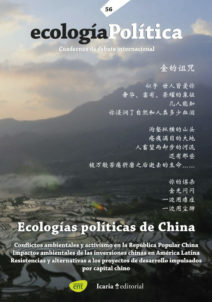 This is the motivation of this issue of Ecología Política dedicated to China, which bases a large part of its contents on the work developed by the team of the Environmental Justice Atlas (www.ejatlas.org). The articles in this issue deal with contemporary issues that can be divided into two main themes: the political ecology of China within its borders and the political ecology of China outside of them, particularly in Latin America. This conversation between political ecologies inside and outside of China is maintained in all sections throughout this issue.